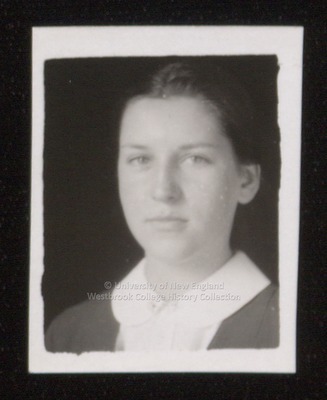 A ca.1934 Westbrook Junior College student portrait has written in pencil on the back A. Gould. Miss Gould's dark hair is parted in the center and pulled back behind her ears. She wears a white blouse with a peter pan collar and a cardigan. A jewelry "tie bar" is just visible at the front of her collar.